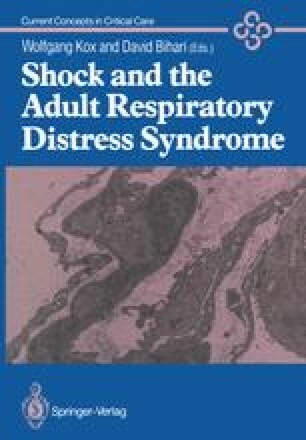 The indications for support in acute respiratory failure are based on clinical, radiological and laboratory evidence: dyspnoea, tachypnoea and panlobar alveolar infiltrates of one or both lungs accompanied by severe hypoxaemia with an arterial oxygen tension (PaO2) or less than 75 mmHg when breathing a fraction of inspired oxygen (FiO2) of more than 0.5 (Artigas et al. 1985). These clinical signs often require an immediate response: in an attempt to improve arterial oxygenation, continuous positive airways pressure (CPAP) is applied via a facemask or an endotracheal tube, but frequently some sort of mechanical ventilation is required. However, the mode of mechanical ventilation depends essentially upon a process of trial and error in which success is monitored by blood gas analysis. Although reliable, this empirical method does not disclose where the failure or potential for improvement in ventilation lies. A method by which the optimal ventilatory pattern could be found should encompass the different anatomical levels of the lungs and their function as well as their mechanics.